Parque La Venta is a remarkable outdoor archaeological museum. 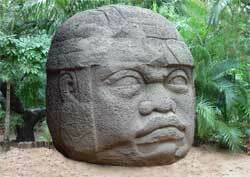 It features colossal stone heads (see photo) sculpted nearly 3,000 years ago by the Olmecs. They are exhibited in a lush tropical botanical garden. Parque La Venta exhibits 4 of the 17 known Olmec basalt stone heads. They were originally in La Venta, about 130 kilometers (80 miles) west of Villahermosa, where the Parque La Venta is located. They were transferred to their new home in the 20th century for preservation's sake. Theories include "half man, half infant" and "half man, half deified jaguar". Some see negroid features, which would suggest that the Olmecs or their ancestors came from Africa.